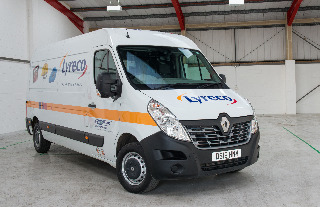 The vans replace vehicles from another brand and won a tender by ERA Fleet Cost Management based on their whole-life costs, payload and the reliability of the other Renault vehicles that Lyreco operates. Lyreco’s Renault Masters have been supplied in (LM35) Long wheelbase, medium roof specification in Business trim. All feature a 135hp 2.3-litre turbodiesel engine as well as front-wheel drive to optimise load space and efficiency. All of Lyreco’s Renault Masters have been supplied by Greenhous Renault’s Shrewsbury dealership and are leased through Fraikin.